The Wealthy Roma: Oxymoron Or Reality? 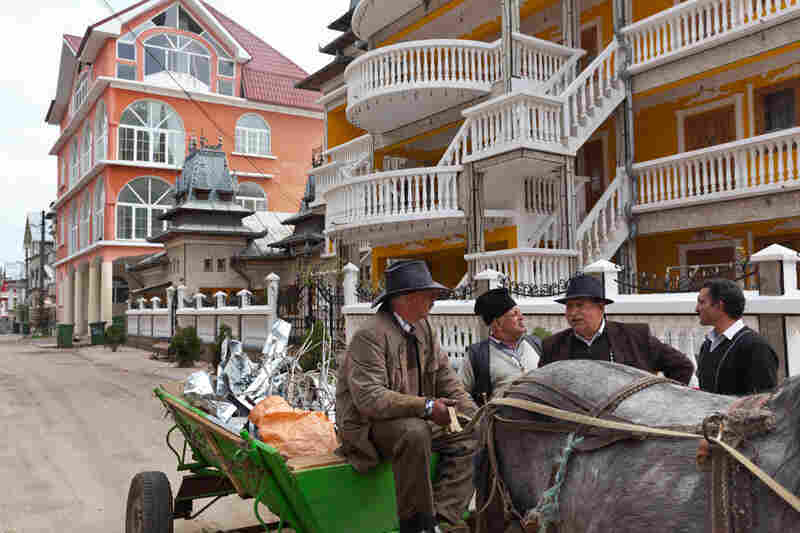 : The Picture Show In one small Romanian town, Roma are building mansions that fly in the face of stereotypes. 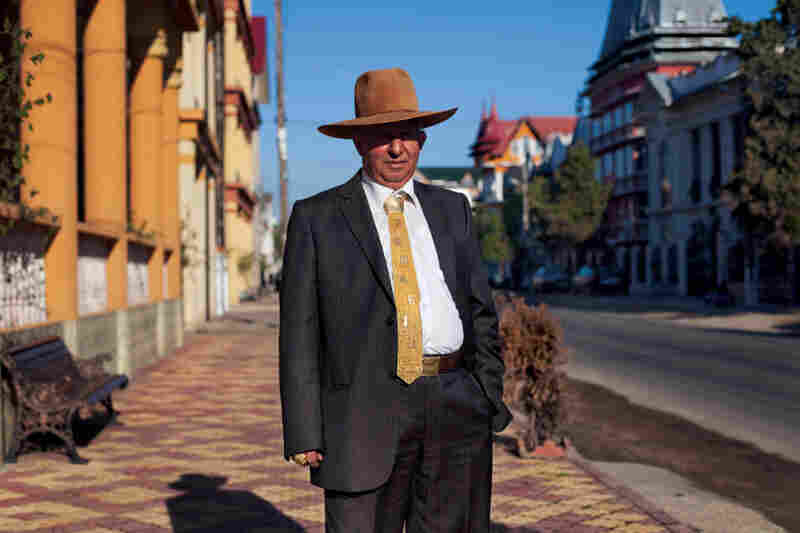 The Wealthy Roma: Oxymoron Or Reality? There are plenty of stereotypes attached to the Roma — a traditionally itinerant people, mostly in Eastern Europe and often called "gypsies" (a term derived from "Egyptian," once their assumed place of origin). "For many of the estimated 2 million Roma in Romania, or about 10 percent of the population," according to National Geographic, "life is poor and nasty, their communities stuck in squalid city slums or in cardboard shanties on the edges of town." That's why, to some, the idea of "wealthy Roma" may seem like an oxymoron. 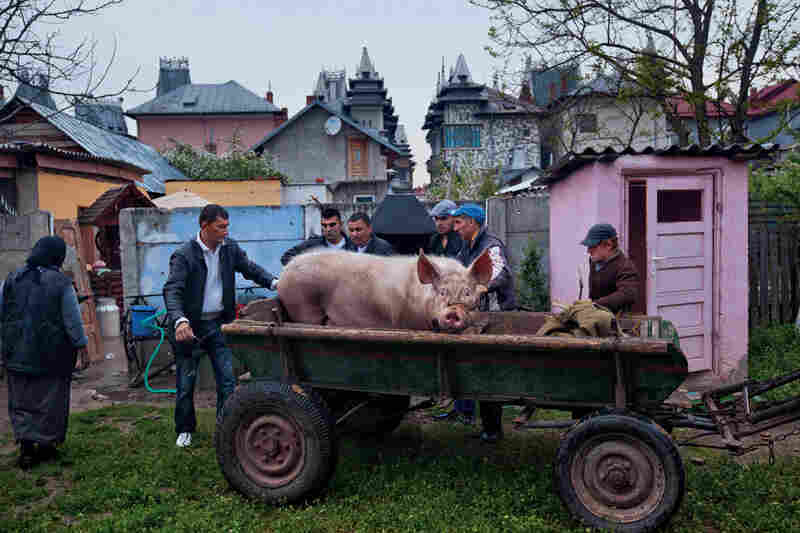 But a story in the magazine's September issue explores one town outside Bucharest where the Roma are building mansions that fly in the face of those stereotypes. 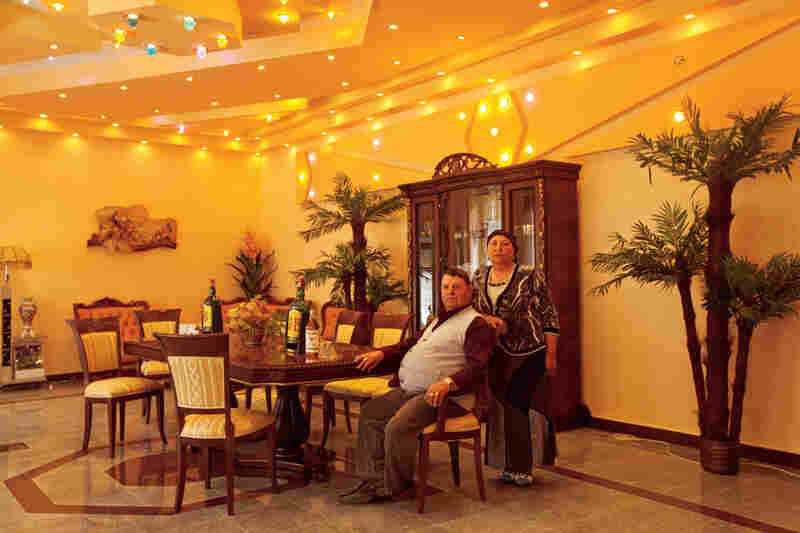 "Buzescu's well-to-do have a thing for flamboyant decor. 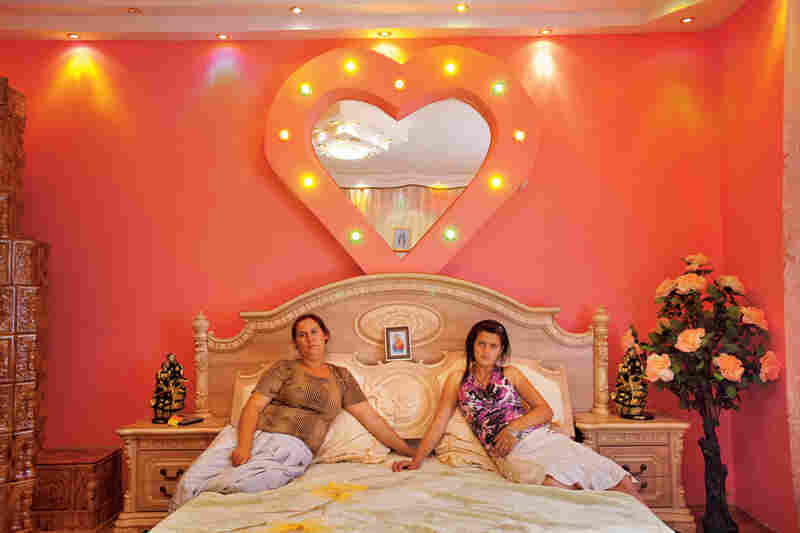 Vandana Ispilante sits with her 13-year-old daughter, Edera, in a bedroom that looks like a honeymoon suite — except for a picture of the Virgin Mary on the headboard. Odds are Edera's closet will never hold head scarves and long flowered skirts, the traditional Romani dress." 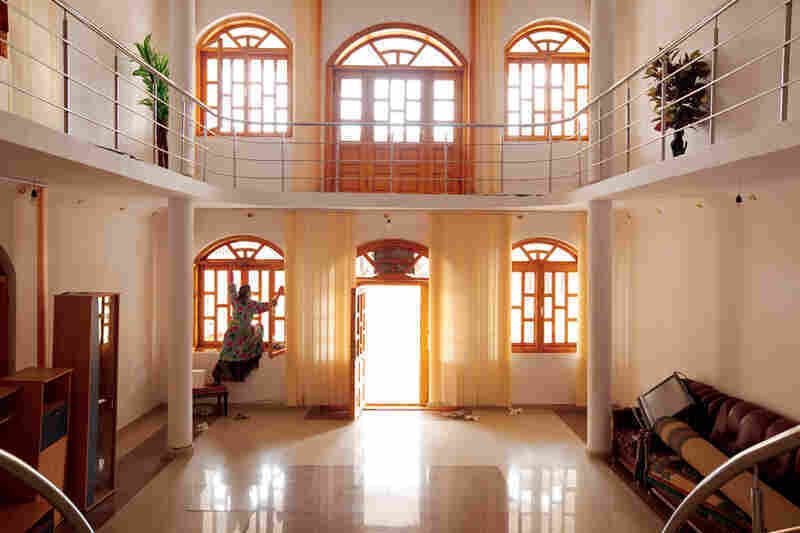 "Many grand spaces are used only on holidays and for weddings and funerals. To prepare for Easter, Simona Iancu shines an entrance hall." "Doru and Valeria Constantin seldom entertain in their glittery, marble-floored dining room." "In a backyard in the wealthy quarter, traditional village habits maintain a hold. On the day of a baptism, men send off a gift pig to the godparents. Some affluent Roma, especially older ones who grew up traveling in horse-drawn caravans, are uneasy in the mansions and still use outhouses and outdoor kitchens." "Zaharia Bureata greets Easter morning in a tie spun from solid gold thread, its front spelling out his name and the brand of his car, a Hummer. Others in town have copied his style. 'People think all Roma are poor and filthy,' declared one mansion dweller. 'They should see us.' "
Writer Tom O'Neill (no relation) explains that Roma in the town of Buzescu originally made money as Kalderash, or coppersmiths. But after the fall of communism, O'Neill explains, the Kalderash traveled the country gathering scrap metal from abandoned factories and sold it for a pretty penny. "By playing the commodity market," the article reads, "some Buzescu Roma reaped hefty profits." Without revealing too much more, it's a fascinating read about what O'Neill calls the "rarest of Europe's demographics," and there are more photos over there.